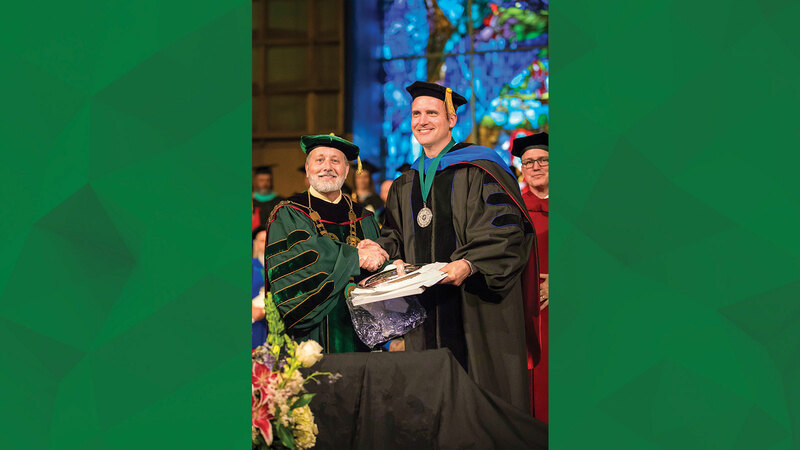 Dr. Bret Roark received the 2018 Distinguished Teaching Award during Spring Commencement in May. The award is the highest honor for OBU faculty members, presented annually to a professor who has taught at OBU for five consecutive years or more and has “distinguished himself or herself in the teaching profession over a period of several years as acknowledged by former students, peers and current students.” Roark serves as professor of psychology, Ralph and Marie Barby Chair, and division chair for Behavioral and Social Sciences. Dr. Bret Roark spent his earliest childhood years in McKinney, Texas. He came to Oklahoma during junior high, attending school in Midwest City and ultimately graduating from high school in Ponca City, where his father, Dr. Mack Roark, ’58, professor emeritus of Bible, was pastor of First Baptist Church, Ponca City. In 1984, both came to OBU, Bret as a student and his father as vice president of religious life. The third generation to attend OBU, Bret went on to earn a bachelor’s degree on Bison Hill in 1988 and both master’s and doctoral degrees from Texas Tech. Before finishing his doctorate, an opportunity arose for an assistant professor position at OBU. Roark joined the faculty that fall as an assistant professor of psychology. 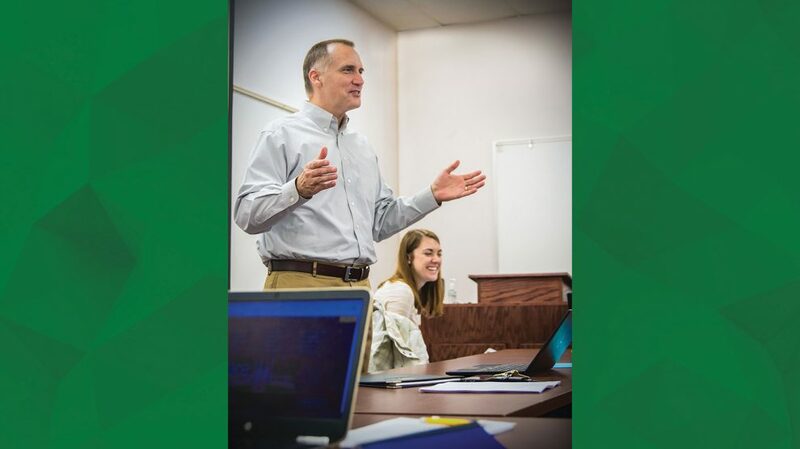 He was grateful for the opportunity, as he knew teaching at OBU was a great fit for him. While Roark has been recognized with both the Promising Teacher Award and the Distinguished Teaching Award, he remains humble, seeking to continuously improve his craft while learning from and admiring the manner in which other professors instruct their students. In addition to the impact his colleages have made on his career, Roark credits another group on campus with affecting him deeply: the students. Roark cherishes the time spent with students and is passionate about helping shape their lives and careers in positive ways, just as his professors did for him. Roark also has a clear vision for what he intends his students to learn as well as the knowledge he believes they value most from taking his courses. “If you were to ask my students what are the three most important things I want them to learn, they would answer ‘Define an interaction, identify the variables in a study and use APA format correctly.’ Technically, they would be right because I do think that every psychology major should be able to do those things. Roark receives the Distinguished Teaching Award from Dr. David Whitlock during the 2018 Spring Commencement. Not only is Roark a third generation Bison alumnus, but he is also a second-generation Distinguished Teaching Award winner, with his father receiving the honor in 1997. Roark’s dedication to teaching excellence extends beyond his undergraduate teaching duties. He is a faculty sponsor for the OBU chapter of Psi Chi, the International Honor Society in Psychology. He also teaches graduate courses in the Marriage and Family Therapy program as well as a course in the MBA graduate program. He is currently supervising 12 students conducting research projects and is providing supervision to the Psi Chi Research Team as they engage in their research project. Recently named chair of the Division of Behavioral and Social Sciences, he serves as chair-elect of Faculty Council. When not teaching, he enjoys spending time with his family, including his granddaughter, Addison, who just turned one. Yet, he doesn’t need to get away from work to see most of his family members. His wife, Radonna, is assistant professor of French at OBU and they have three children currently attending as fourth-generation Bison. Brianna is a senior early childhood and elementary education double major, Alyssa is a sophomore finance major and Brennan is a freshman management major. Copyright © 2018 Oklahoma Baptist University.